March certainly “went out like a lion” on Conroe area stages. First I had the great pleasure of witnessing one of the finest acting performances I have seen in Montgomery County as W. Ryan Willingham took on the central role of the Stage Manager in the Crighton Player’s marvelous production of Thornton Wilder’s Pulitzer Prize-winning play, ”Our Town”. Beautifully directed by Grace Thompson at Conroe’s Owen Theatre, this touching and thought-provoking play weaves the tale of a small town in New Hampshire in the early 1900’s. It was a time when doors were left unlocked and neighbors really knew and cared for one another. It was an era before automobiles, television, cell phones, and countless other distractions would often seem to detract from the real intimacy that can be the foundation of a solid community. For all the wonders of our age, something has been lost in our modern world, and Wilder’s play brilliantly reminds us of that dichotomy. Another world of richness in the arts opened up for Montgomery County residents last Monday evening as the Conroe Symphony took to the splendid stage of Conroe’s beautiful Ark Family Church to perform a concert of “Sounds of the West,” under the skilled baton of conductor, Don Hutson. I was particularly pleased with the opening selections by Aaron Copland, as the late composer lived for many years in the Hudson Valley area of my New York hometown where his home is now the only National Historic Landmark in the country directly associated with a concert music figure. The galloping start was Copland’s “Hoedown,” with its pulsing excitement, echoing brass, racing strings and foot-tapping theme. His “Saturday Night Waltz” followed, opening with sweeping grandeur and moving to the light and lilting themes that weave its musical spell. Next came the featured work of the evening, the American premier of local composer Charles Fitts’, “Chisos Epiphany,” his musical homage to the beautiful Texas mountains of Big Bend National Park. I was fortunate to experience the austere and rugged beauty of that area many years ago, and this captivating work convinced me it is time to return. It is a very visual piece as the desert day breaks amid the soft opening rumble of the kettledrums, and the shimmering tinkle of percussion. The flutes share in this awakening world, with additional accents from the drums and cymbals as the sounding brass brightens the scene. With the pace of a gently rolling river, there is a strange and wonderful seduction of the listener’s senses as the work’s haunting evolution reveals a world full of mystery. Moments of explosive beauty drift away, bringing us at last to the meditative whisper of the work’s conclusion. Bravo! During intermission in the expansive and grand lobby of the church, talented vocalist Emmett Kelly strummed his guitar and sang a delightful selection of cowboy songs. Then maestro Hutson returned to the stage for the spirited, hand-clapping and foot-stomping, “Pops Hoedown” by Richard Hayman. Peppered with familiar tunes like, “Pop Goes the Weasel,” it was fun for all. Next came the eerie suspense, sweeping majesty, and thrilling musical power of the Trevor Jones / Randy Edelman motion picture theme for 1992’s, “The Last of the Mohicans.” Then the audience was treated to an exquisite rendition of Daniel E. Kelley’s “Home on the Range,” with a blissfully sweet arrangement by Carmen Dragon that featured perfect horse trotting from the percussion. The piece seemed to sound better than ever with a stage full of Texans performing it. 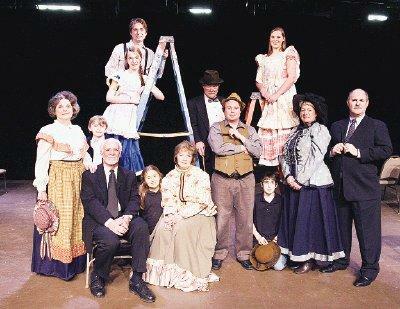 Crighton Players will present “Best Little Whorehouse in Texas” May 14th through 28th. For tickets or information call 936-539-4090 or visit the website at www.crightonplayers.org. Conroe Symphony’s next concert, “American Visions,” will be presented at Ark Family Church on Monday, June 28th at 7:30 p.m. Tickets are available at the door for $15 for adults, and $5 for children under 12. Call 936-760-2144 for information.